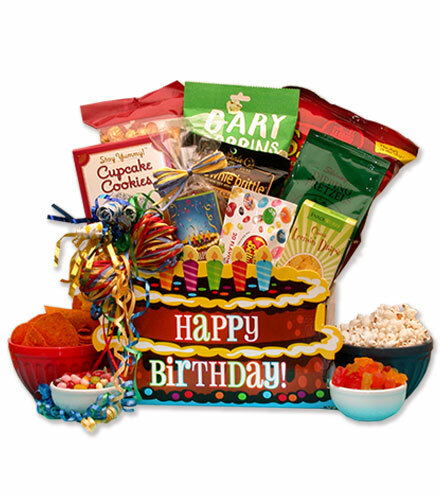 A Birthday Party in a Gift Box will be delivered to your special someone jam packed with a variety of treats and sweets. All the favorites are included - gummi bears, brownie brittle and Jelly Belly Jelly Beans are used in creating this beautiful and unique gift. This birthday gift is a suitable gift idea for the home or office. This gift box includes: Gary Poppins jalapeno popcorn, Salsa tortilla chips, butter toffee caramel corn, Cupcake chocolate cookies with sprinkles, Brownie Brittle, pretzel sticks, Happy Birthday theme bag filled with fruity gummi bears, Jelly belly's 20 most popular jelly beans bag, Lemon drops candies, Happy Birthday cake themed gift box, two birthday horns. This gift measures 12x8x14, weighs 4 pounds is wrapped in cellophane and is topped with a handmade raffia bow. Birthday Party in a Gift Box! A valid voucher code will be required at checkout to apply the discount.